Promote your child’s creativity and self expression with our children’s art classes! We encourage youth of all ages to find their individual style, while introducing them to different artistic mediums and age-appropriate techniques. Our class offerings include oil pastel, watercolor, acrylic, colored pencil, craft projects, and much more. Completing a “work of art” to take home at the end of each class not only helps build confidence, but also imbues a lifelong love of art in children. 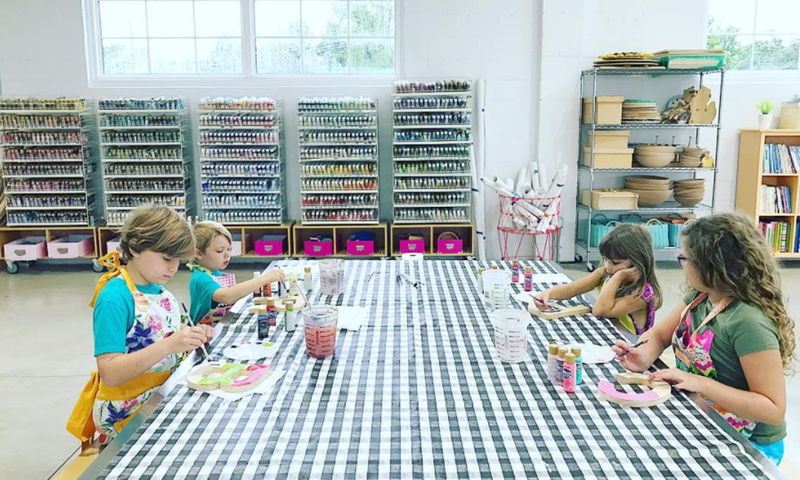 Art classes are also an excellent opportunity for children to make new friends … as well as an occasion for busy parents to get a few things done while their child is enjoying an enriching activity. Classes vary in length and duration. Our new schedule and convenient online signup will be posted below in March or April. Aprons & all materials are included in each class. WIND + JAMES is the perfect place for busy adults to escape their daily stress and expand their mind, while learning something new in our upcoming adult enrichment classes. You will be transported to a happy and creative place the minute you enter our casual + chic converted warehouse space. Leave your worries at the door, and unwind with an art class, a yoga session, a book discussion, or another of our many soon-to-be-announced adult enrichment classes. Do you have a special skill or ability, and a passion for sharing it with others? We are always looking for engaging + enthusiastic teachers! Talk to us about your ideas for adding an adult enrichment class to WIND + JAMES’ offerings.